Today we gonna have our Preliminary Design Review here at ESRANGE. We are looking forward to a constructive discussion! 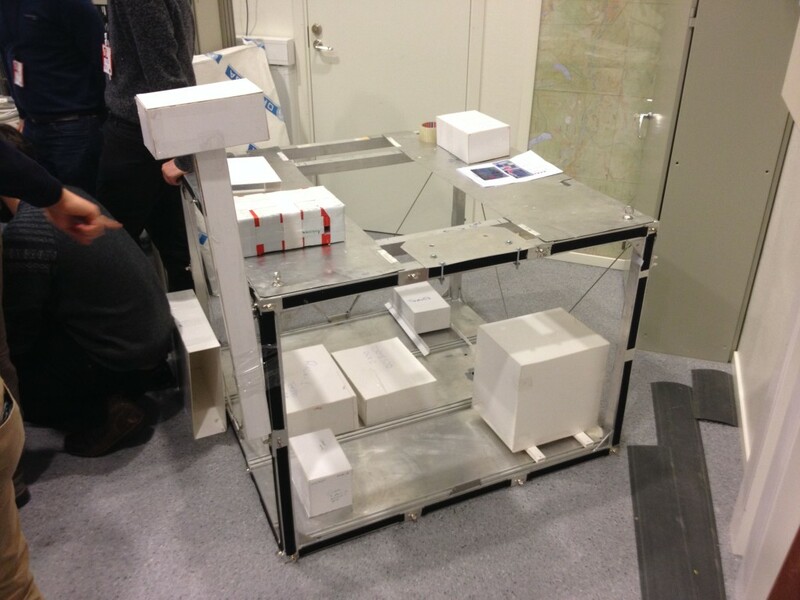 Yesterday we had an experiment-mockup construction session to check the arrangement of the experiments on the BEXUS gondola. Our experiment is the big box on the right bottom corner of the gondola. Dieser Beitrag wurde unter General abgelegt am 03/06/2014 von Dennis Trautwein. After arriving one day later than all the other teams, we are looking forward for our second day here in Esrange and the PDR. Dieser Beitrag wurde unter General abgelegt am 03/05/2014 von Stefan Wraase. Flight was cancelled, now we are taking a detour via Frankfurt to Stockholm and won’t reach Kiruna for the preliminary design review (PDR) today. Hopefully we have better luck tomorrow. Dieser Beitrag wurde unter General abgelegt am 03/02/2014 von Dennis Trautwein.